This Julius K9 IDC powerharness has a smooth, sporty look. The exterior is made of strong nylon can take a beating. The inside is lined with soft cotton. This lining is breathable and therefore skin-friendly. At the top of the harness is a handle (from size mini-mini) for the dog to be lifted or to grab as well as a solid ring to fix the belt. 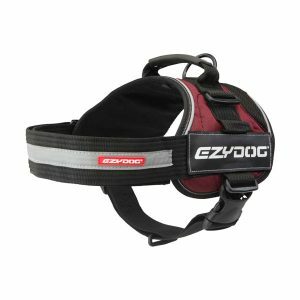 The chest strap features reflective piping is easy to customise by using velcro. The cummerbund has sliders which also is easy to adjust. (With large dogs it is necessary to keep a hand there between and with small dogs two fingers, should not be too tight). The cummerbund closes with a hardened sturdy belt buckle. The cervical vertebrae of the dog will be spared by the use of a harness . The dog has freedom of movement. The harness has reflective piping for good visibility in the dark. A lot of choices in colors and due to a friendly price suitable for many dogs. The dog harness is extremely popular.